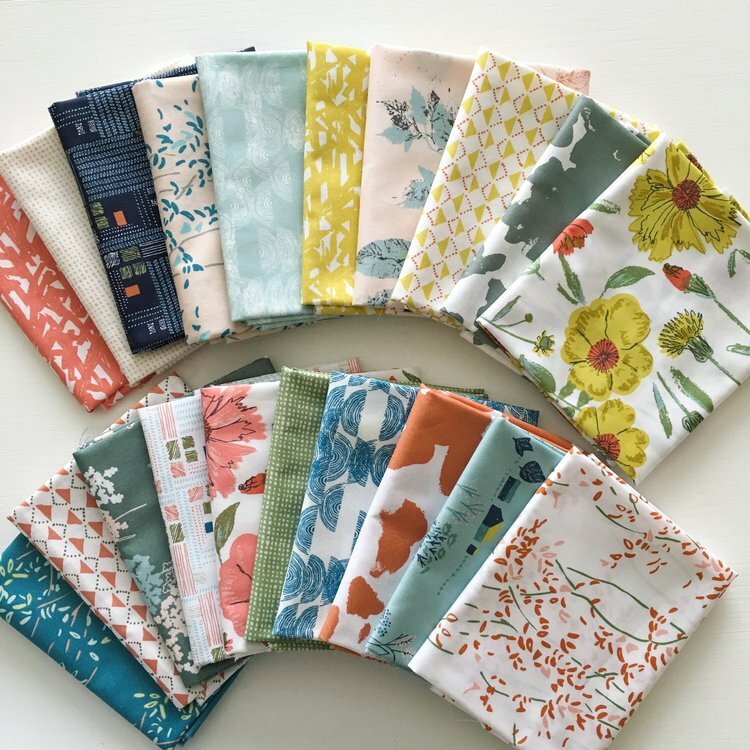 I have been following Sharon Holland, a designer for Art Gallery Fabrics, for awhile now, and in the process we have made a lovely connection via social media. She designs the most beautiful fabrics in soft and soothing colors. Her newest line, Bountiful, was inspired by the Midwest. Having lived in the Midwest (Oklahoma and Kansas) myself for quite a few years, these fabrics really speak to me, so when she invited me to participate in this blog tour and make something with this line, I said yes without hesitation. I had a fat quarter stack of the entire line to play with, and then added some Pure Elements solids from my own stash. I decided to use my Delta Breeze pattern, which is a modern take on the classic Bear Paw block. Having only made it in solids, I was eager to see what it would look like in these pretty prints. I'm so happy with how it turned out. I really like that some fabrics are bolder, and some are subtle and invite you in to take a closer look. The beautiful quilting was done by Darby Myers, a classic Baptist fan with "pearls" between some of the fans. You can see find a recap of Week 1 of the blog tour here. Yesterday Katie from The Simple Life Pattern Company made the cutest dresses, and Monday you won't want to miss whatever it is that Maureen Cracknell, another Art Gallery artist, has to show. I hope you will take the time to check out all the fabulous designers in the line-up. Cindy Wiens - Live a Colorfullife--you're here now! 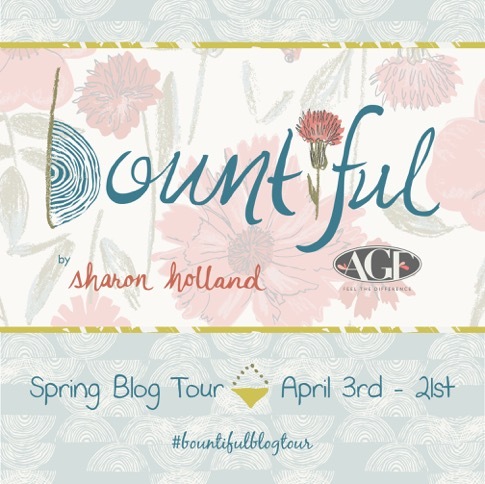 Also, you can follow me on Instagram at @liveacolorfullife and Sharon at @sharonhollanddesigns. And finally, here are Bountiful Breeze and Delta Breeze side by side, "fraternal twins." I'm also linking up today to Crazy Mom Quilts, TGIFF, and Confessions of a Fabric Addict. Thanks for stopping by, and have a lovely weekend. That is beautiful. It is every bit as pretty as the solid one. "Grandma Vicki Loves Charlotte Always and Forever"!!! Wonderful combination of fabric and design, and the quilting is the cherry on top. This is a BEAUTIFUL quilt! I love your pattern (in both this and the Soho one) with your version of the bear paw. I have so much enjoyed looking around your blog and wanted to let you know that you have a new admiring fan both here and IG! Thanks for sharing your creativity! For the record, I also use a pattern more than once. Different fabrics make it look new and different, as you have shown with Delta Breeze! Beautiful quilt, those bold & subtle fabrics are so pretty used together! Wow, both are gorgeous! Still on my must-make list! Wow!! I love seeing both quilts side by side. Seeing how the same design looks in different fabrics is always such fun and often quite a surprise. They are both beautiful.